The Aotearoa New Zealand International Development Studies Network is an interface amongst people and organisations working in or researching international development. It facilitates the exchange of ideas, information and research amongst Development Studies’ (and related disciplines’) staff, students and other stakeholders in development. These include aid and development NGOs, private sector development practitioners and government (especially the Ministry of Foreign Affairs and Trade). The network has a global reach with over 2,000 members from Aotearoa, the Pacific, Australia, Southeast Asia, India, China and further. Overall direction of DevNet is set by the National Forum, which meets during the biennial DevNet Conference; it is open to anyone to attend. Governance is by the steering committee, which meets three times per year. Each Aotearoa NZ university has one representative, while associate representatives come from the Ministry of Foreign Affairs and Trade and the Council for International Development. The idea for a Development Studies network reflected the need for Aotearoa NZ’s small but diverse ‘development community’ to link together through dialogue and information sharing. In 1993, Massey University under the guidance of Croz Walsh organised a conference called ‘Development that Works: Lessons from the Asia Pacific’. It brought together a diverse array of development representatives to discuss development initiatives and the lessons learned. By 1995, three Development Studies programmes were offered at Aotearoa NZ universities: Auckland, Massey and Victoria. Penny Schoeffel (then Fred Deyo) at Auckland University, John McKinnon from Victoria University and John Overton from Massey University were in contact over a number of issues relating to their programmes and were keen to cooperate further and share information. They were eager to strengthen their relations with the Ministry of Foreign Affairs and Trade’s (MFAT) development division, the NGO umbrella group – Council for International Development (CID) – and the wider development community. There was also contact with Croz Walsh (then at the University of the South Pacific) who distributed the newsletter Te Amokura to those with an interest in Development Studies. In mid-1996 the Development Studies programme at Auckland University sent a questionnaire to development NGOs, consultants and other academic programmes to gauge levels of interest in establishing a communication network and related activities for development practitioners, policy makers, students and academics. After a very positive response, this was followed up with a meeting among MFAT, non-governmental organisations (NGO) representatives and Development Studies programme directors, where it was agreed to formally initiate a Development Studies Network. That year, DevNet was officially established to link Development Studies programmes, students of development, development practitioners, NGOs and donor agencies together as a way to share information and cooperate on activities of mutual interest. The network was initially located at Auckland University for its pilot year 1997-98 under the coordination of Ross Bell. The year culminated in the inaugural conference ‘Linkages in Development: Issues of Governance’, again with a focus in the Asia-Pacific region. Generously supported by MFAT, it was a significant and successful event – appealing to a large number of academics, students and development practitioners. The conference demonstrated the importance of bringing together the wider development community to learn from each other. In November 1998, DevNet’s secretariat was moved to Dev-Zone, a programme of the Development Resource Centre (DRC). Te Amokura lapsed but electronic communication and use of the DevNet website expanded significantly. learning opportunities around NZ, the Pacific, and the world. Tony Binns came to Otago in the mid-2000s and initiated a cross-disciplinary ‘Poverty Research Cluster’. Changes also occurred in the leadership of the various Development Studies programmes, with Vijay Naidu then John Overton heading the programme at Victoria, Regina Scheyvens coming on board to replace John at Massey, and Ken Jackson & Yvonne Underhill-Sem heading the programme at Auckland. Biennial conferences were held, and they were all supported by the semi-autonomous unit NZAID which had been created out of MFAT. Conferences were hosted by Victoria (2000 – Poverty, Prosperity and Progress), Massey (2002 – Contesting Development), Auckland (2004 – Development on the Edge), Otago (2006 – Southern Perspectives on Development) and Victoria (2008 – Peripheral Vision). 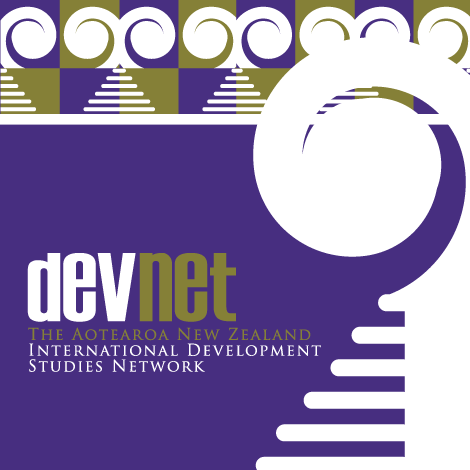 In 2007, a joint NZAID and DevNet Symposium was also held on ‘Civil Society and Governance’ with an emphasis on complementing the more wide-ranging DevNet conferences. During 2008-09, the DRC underwent a rebranding that led to the launch of Global Focus Aotearoa, however, with a change of government in 2008 and a reintegration of the aid programme into MFAT, came a drop in funding for development education. This meant that by the end of 2010 DevNet lost all funding for its secretariat in Wellington, so this closed down. Massey hosted the 2010 DevNet conference, Making Development Sustainable, and then took on board the secretariat functions of DevNet from 2011, maintaining a more streamlined website. Biennial conferences remain a highlight on the DevNet calendar, and have been held biennially despite fluctuations in available funding. Conferences were hosted by Auckland (2012 International Development Conference – Integrating Research, Policy and Practice), Otago (2014 – From Vulnerability to Resilience), and Victoria (2016 – Pacific Currents, Global Tides). For the first time, the city of Christchurch was the location for DevNet 2018 – Disruption and Renewal – which was hosted by the Universities of Canterbury and Lincoln. Waikato University and AUT now have regular input to steering group meetings. New DevNet initiatives in this period included the establishment of biannual ‘policy dialogues’ with MFAT founded around research and policy issues of mutual interest, ‘1 Thing’ videos, and a thesis database.